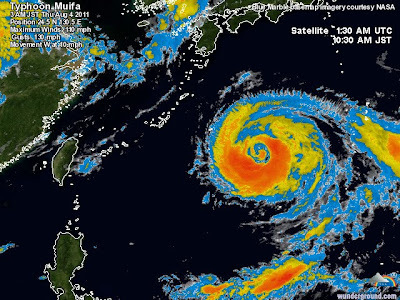 Typhoons have become a regular part of our life here on Okinawa during the late Spring - early Fall months. Our most recent visitor is Muifa, which is one of the most powerful typhoons we've experienced yet - and it is by far the longest-lasting one! We are now on day two, with another day or so expected. I generally get around to writing my blog posts whenever I have time, which is sometimes even up to 3 weeks after the event I'm writing about actually occurs! Not this time - I am incredibly bored, locked inside and have nothing better to do than to update you on our situation. As I'm writing this, I actually have headphones on to keep out the deafening sounds of the wind roaring our building and the glass in our windows banging! (It was not easy falling asleep last night as you can probably imagine) On most occasions, I don't enjoy living in a tower - especially when I have a load of groceries to bring home:( However, during typhoons, I am thankful for having a tower apartment - we don't have to worry about neighbor's patio furniture or grills hitting our house, we don't have to worry about water seeping under our doors, and we have little enclosed balconies, so we are able to step outside still without being blown away! No worries family - we're being safe! Love you!